Rep. Martin LaLonde (D-South Burlington) joined Rep. Kurt Wright (R-Burlington), left, on a bill to ban teacher strikes earlier this week, but Thursday they parted ways. When he arrived at the Statehouse Thursday morning, Rep. Kurt Wright (R-Burlington) thought his long-running effort to ban teacher strikes might still have a chance at success. The day before, a key amendment to make that happen fell short by just one vote on the House floor. Instead, it was replaced by a study — the traditional legislative tactic to kill a bill. “I did toss and turn all night thinking about the one vote,” Wright said. With the bill up for final passage Thursday, the Burlingtonian thought he might manage to reverse the result. Two Republican supporters had been sick Wednesday, and a third, Rep. Tom Terenzini (R-Rutland), who'd voted against the amendment, had changed his mind. Yet another, Rep. Patti Komline (R-Dorset), had strategically switched her vote from yes to no Wednesday, so that she could make a motion to reconsider the amendment the next day. But Wright's hope proved short-lived. Though he'd gained support from a few stray Republicans, he soon realized he'd lost several Democrats — most notably, Rep. Martin LaLonde (D-South Burlington). A school board member motivated by his experience with his city's five-day teacher strike last fall, LaLonde had brokered the compromise amendment that came so close to passing Wednesday. He’d spent two days telling fellow lawmakers how bad the strike and an earlier contract imposition had been for his community. “Those actions did not serve the community, the students or the teachers,” LaLonde had argued earlier in the week. But by Thursday, LaLonde was finished with the fight. Wright and Komline said they heard Democrats were pressured by caucus leaders to oppose reconsideration. “They were told this became about supporting the speaker,” Komline said, referring to House Speaker Shap Smith (D-Morristown). LaLonde claimed otherwise. He said he reached his decision to oppose reconsideration on his own. The freshman legislator said he expected to be pressured but never was. By the time the House convened Thursday afternoon, Wright and Komline had realized they didn't have the votes to push for reconsideration, so they did not request it. By then, Democrats and Republicans alike had decided they didn't even want the study. Instead, many of them banded together and voted 104 to 43 to kill the entire bill — study and all. Afterward, Wright dwelled on how close he’d come to achieving his goal of banning teacher strikes. Had Terenzini changed his mind a day earlier, Wright may well have won the vote. Terenzini said Thursday he'd been swayed that morning by emails he received from the Rutland Central Supervisory Union school superintendent and the Rutland town select board chair, both of whom urged him to support the ban. “I was willing to do that," he said. "It probably would’ve been a cost-saving to the town." Terenzini said he had no idea the measure would fail by just one vote. An openly miffed Wright said he had made it clear to his fellow Republicans that every vote would matter. “To come so close,” he said Thursday, his voice trailing off. Wright's bill may yet have another chance. 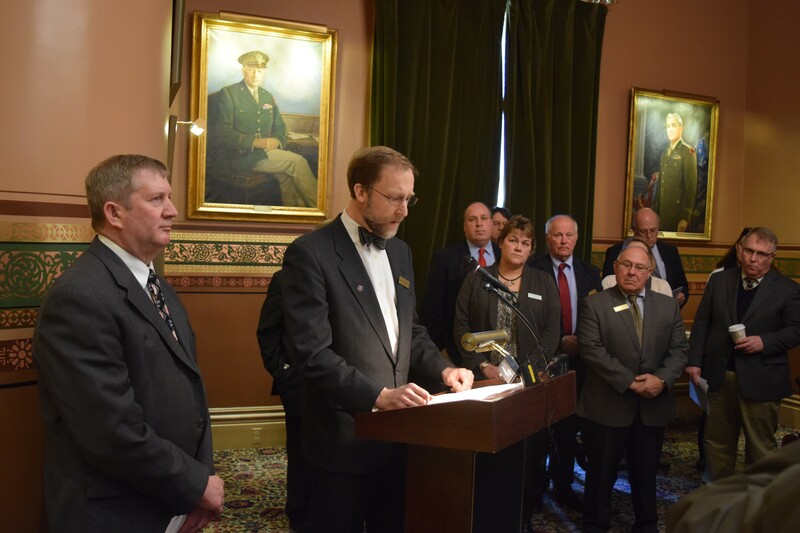 Senate Minority Leader Joe Benning (R-Caledonia) said Thursday his caucus plans to bring it up as an amendment to a broader school consolidation bill. “It’s very likely that subject will come up on the floor,” Benning said.